Army School Lansdowne, Pauri Garhwal (Uttarakhand) has released notification for the recruitment of teaching staff purely on part-time and cotractual basis. 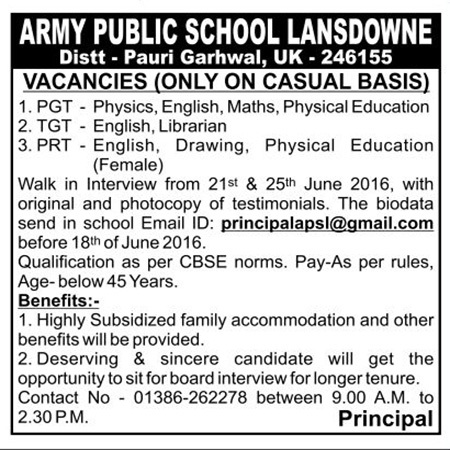 Army School Lansdowne, Pauri invites eligible candidates for various teaching posts. A walk-in interview will be conducted on 21 June & 25 June 2016 at the school campus. The selection of candidates will be done on the basis of performance in the walk-in interview. Eligible candidates may send their updated Bio-Data to principalapsl@gmail.com on before 18 June 2016. Candidates may attend the walk-in interview to be held on 21st June & 25th June 2016. 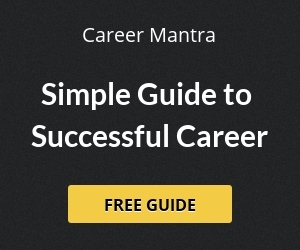 Candidates are required to bring along all original certificates, testimonials, and publications etc. along with one xerox set of all the certificate for the interview. Candidates are required to be present prior to 9.00 AM for the document verification process. Help us to improve this article/job posting "Teachers Recruitment in Army School Lansdowne, Pauri". We would be glad if you can comment below and provide your valuable suggestions and feedback. If this page have any wrong information/list or out of context content, then you can report us as well. I want to know about the result of teachers vacancy interview which was conducted in June 23, I also have appeared for the post of drawing faculty .